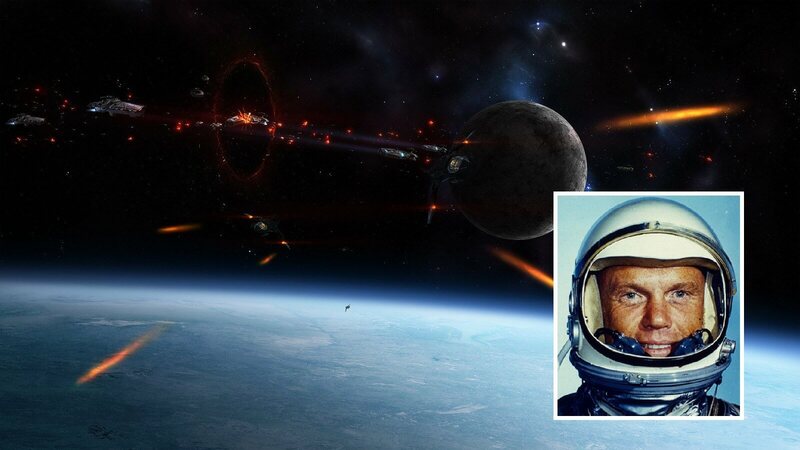 Take a look at this incredible audio file where we can hear the astonishment of astronaut John Glenn after his capsule was surrounded by countless strange UFOs. This audio transmission can easily be described as one of the most surprising evidence of a mysterious extraterrestrial presence during manned space missions. This old audio file allows us to hear a small part of the conversation between the Mercury-Atlas 6 (MA-6) capsule piloted by John Glenn and CAPCOM, on February 20, 1962, the first manned orbital mission in the United States. Launched from the Kennedy Space Center in Florida, it completed a successful three-orbital mission around the Earth, reaching a maximum altitude of approximately 162 land miles and an orbital speed of approximately 17,500 miles per hour. The Mercury spacecraft “Friendship 7” landed in the vicinity of Grand Turk Island. The duration of the mission from launch to impact was 4 hours, 55 minutes and 23 seconds. John Glenn : This is Friendship Seven. He is blinded by the clear range. It started just when I gave that mark; I go to the dark filter to see it appear. John Glenn : This is Friendship Seven. I will try to describe what I am seeing here. It looks like a large mass of very small particles, which are brightly lit as if they were luminescent. I never saw anything like that. They are rounded up a bit; They come through the capsule and look like little stars. A whole rain of them coming towards me. John Glenn : they revolve around the capsule, they go in front of the window and they are all brightly lit. Probably averaging maybe 7 or 8 feet away, but I can also see them all below me. Intrigued by events, CAPCOM asked Glenn to describe the objects and if they were impacting his spaceship. CAPCOM : Roger, Friendship Seven. Can you hear any impact with the capsule? Short. John Glenn : negative, negative They are very slow; they will not drive me further than 3 or 4 miles per hour. They are going at the same speed that I am approximately. They are only way below my speed. Short. John Glenn : Yes, they have a different movement, from me, because they swirl around the capsule and then move away along the path I’m looking for. John Glenn : Are you receiving? Short. There are literally thousands of them. After describing the objects, Glenn receives no response from CAPCOM and wonders if he is in contact with anyone while continuing to talk about the strange objects around his spaceship. John Glenn : This is Friendship Seven. Am I in contact with someone? Short. Eventually, almost five minutes after describing the events, CAPCOM responds, saying that Glenn sounded a bit “confusing”, and was asked what his oxygen levels were. Strangely, CAPCOM did not address the strange events with Glenn, who explains that the mysterious particles are still around the spacecraft. After realizing that CAPCOM does not respond, Glenn decided to photograph the mysterious objects. Then, CAPCOM asks how large the particles were and if they moved or floated with it. CAPCOM suggested that the particles may have come from the spacecraft, but Mr. Glenn said that this was not the case. Interestingly, after the successful orbit of “Friendship 7”, another astronaut aboard the capsule “Aurora 7”, named Scott Carpenter, also saw mysterious objects in space. NASA scientists eventually observed the mystery and concluded that the objects seen in space were just ice particles trapped by sunlight. NASA claimed that ice had accumulated on the outside of the capsule and that what the two astronauts saw was ice particles floating freely. However, Mr. Glenn was not convinced by the explanation. During his second orbit, he reported seeing the objects again in miles in each direction. What do you think? Did Glenn have a sensory experience, or was it really Ice? As always, we will never know … or what?